Western Digital Corporation introduced two new ultra-transportable solutions in its high-powered G-Technology® G-SPEED® Shuttle product family. The new solutions are designed to meet the demands of professional content creators who need lightning-fast transfer speed and high-capacity storage solution that can easily be moved from the studio to wherever your project takes you, and back. The new 4-bay G-SPEED Shuttle solution seamlessly integrates into the Thunderbolt™ 3 ecosystem* and delivers the capacity and performance needed for professionals to thrive in creative media and entertainment workflow environments, yet is designed with transportability in mind to quickly and safely get the data in the hands of the post-production teams. For example, with the G-SPEED Shuttle, a professional can transfer one hour of 4K footage at 30 frames per second (fps) in just minutes at up to 1,000 MB/s. “The value of captured video content is immeasurable as it can’t be easily reshot or recovered if lost. One of the biggest pain points facing film makers is not having the ability to move the massive amounts of footage quickly and reliably to the next stage of the workflow – both physically and virtually. If you’re looking for a fast, high-capacity solution that’s also easily transportable, your options are limited. 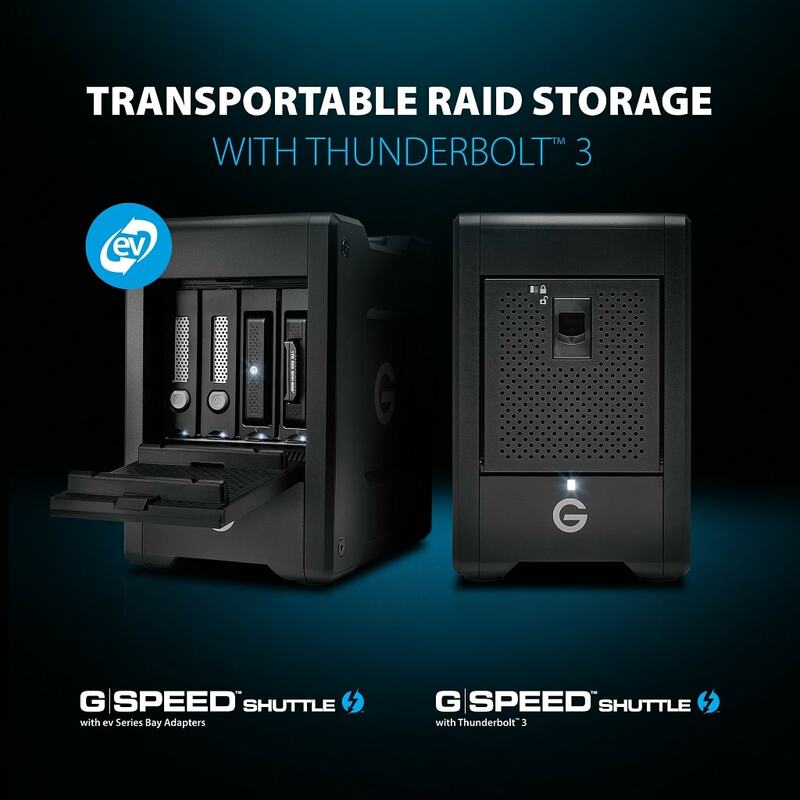 With the power of Thunderbolt 3, the flexibility to integrate with our ev Series, and a design optimized for mobility, the G-SPEED Shuttle is the perfect solution for any on-the-go project team,” said Scott Vouri, vice president strategy and business development, G-Technology, Western Digital. G-SPEED Shuttle with Thunderbolt 3: Able to handle demanding multi-stream workflows of 4K and beyond, both on location and in the studio, the G-SPEED Shuttle solution with dual Thunderbolt 3 ports offers content creators up to 48TB and hardware RAID 0, 1, 5, and 10 in a 4-bay transportable design. Equipped with transfer rates up to 1000MB/s** and removable 7200RPM enterprise class drives, creative professionals have the ultimate storage solution for demanding video and photography workflows and high-capacity storage. The G-SPEED Shuttle with Thunderbolt 3 is now available in Malaysia in 16TB (RM 8,000.00), 24TB (RM 9,875.00), 32TB (RM 11,635.00) and 48TB (RM 15,790.00). All prices are inclusive of 6% GST. G-SPEED Shuttle with ev Series Bay Adapters: While similar in features with the G-SPEED Shuttle with Thunderbolt 3, this model’s integrated ev Series bay adapters improve workflow options and productivity by enabling cross-functionality with all ev Series drives and readers. Users can experience enhanced reliability coupled with fast transfer rates up to 500MB/s and up to 24TB. The G-SPEED Shuttle solution with ev Series bay adapters is now available in Malaysia in 20TB (RM 8,350.00) and 24TB (RM 9,600.00). All prices are inclusive of 6% GST. The above G-Technology solutions use the HGST-branded Ultrastar® enterprise-class drives and are backed by an industry-leading 5-year limited warranty. G-Technology brand storage solutions come pre-formatted for Mac® computers and can be easily reformatted for Windows® computers with the G-Technology Windows Format Wizard. For more information on the full product portfolio from G-Technology, please visit www.g-technology.com. Visit the G-Technology blog for additional insight and perspective from Matthew Bennion, senior manager of product marketing, G-Technology, Western Digital: New Transportable Capture and Transfer Solutions for the Most Demanding On-Location Film and Video Production Workflows.